A newer version (Rev 4) of this circuit board is available. Rev 4 includes a faster CPU, more memory, more I/O and an optional LCD. We recommend you use Rev 4 for new projects. Even though this older board is no longer available, we are keeping these old pages on-line for reference to assist people who purchased or build the older version. Here is the artwork required to etch the printed circuit board. 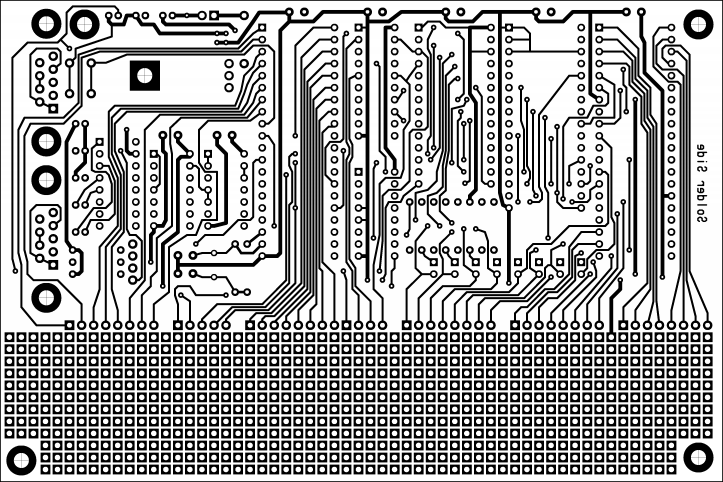 You can buy bare boards, but if you like etching circuit boards, here are the high resolution images you will need. The good news is that board uses a modest number of vias, and has 15 mil (0.38 mm) traces, with 10 mil (0.25 mm) spacing. 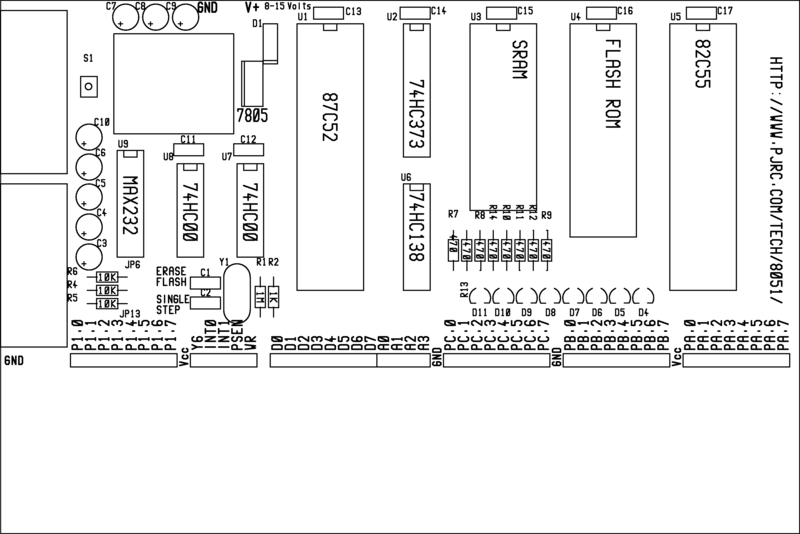 The not-so-good news is that many wires connect on the component side, and the ICs are close enough together that it is very difficult to solder the top layer with a socket... even the machined pin type which has exposed metal, because the nearby socket is very close. If you build this board using a home-etch process (no plated through holes), it will be difficult to use sockets for all of the chips. 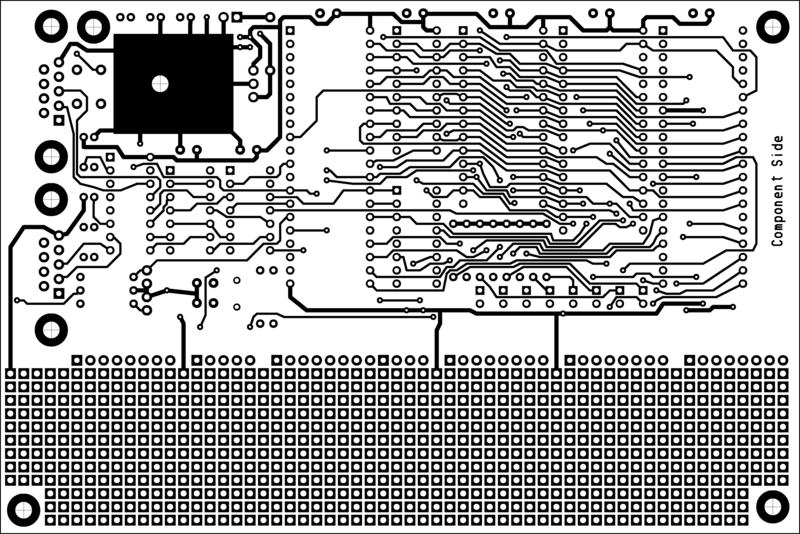 This design and its printed circuit board layout have been placed in the public domain. They are distributed in the hope that they will be useful, but are provided without any warranty, not even a warranty of merchantability or fitness for a particular purpose. Also available on-line as a 600 DPI image. Right click for download menu. For the highest quality results, use these Postscript Files, on a 1200 dpi postscript printer. With a postscript rendering package, such as ghostscript, you can render these postscript files into bitmaps and data streams for non-postscript printers. The images on this page were produced by rendering these postscript files with ghostscript, and then some cropping and scaling (for the 120 dpi previews w/ grayscale) using the Gimp. Both of these programs are free (GPL) and come pre-installed with RedHat Linux.